Describe what Auto-switch mode is. How and when to use Auto-switch mode. SKYVVA providing different data processing mode like immediately processing, Batch processing, Bulk processing modes. where Auto-Switch mode is combination of all three modes. When data processing is in auto switch mode it means processing is based on number of record and IntegrateMaxSize, IntegrateBatchMaxSize. Integrate Max Size: Maximum number of records that SKYVVA Integration Agent can integrate using method integrate. The default value is 200. If the number of records to be integrate is bigger than this value, Agent will switch the API method automatically. Integrate Batch Max Size: Maximum number of records that SKYVVA Integration using method integrate Batch. The default value is 5000. If number of records to be integrate is bigger than this value, Agent will switch to use Bulk API method automatically. If the number of records (Data) <= Integrate Max Size, Interface will run in Normal Mode. If the number of records (Data) > Integrate Max Size and number of records (Data) <= Integrate Batch Max Size, Interface will run in Batch Mode. If the number of records (Data) > Integrate Batch Max Size, Interface will run in BULK Mode. Configuration: How to use Auto-Switch mode? We click on the ‘Account Interface’ link and see the Interface Details and scroll down to Runtime Configuration-Inbound section then checkbox on Use Auto-Switch Mode. How to integrate from other system? 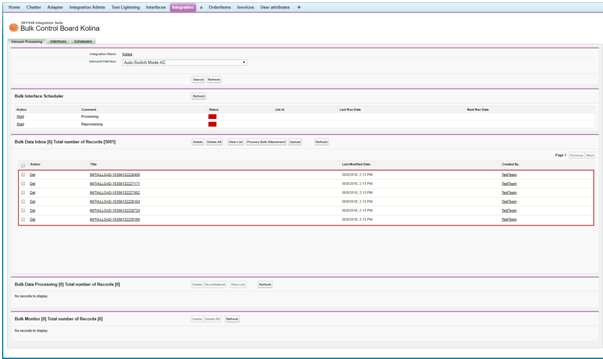 After running the Agent-UI, the Integration Control Board will popup then you have to click on Integration Wizard. Select your agent the Property File. We have to select the existing integration and interface on which we have to process data. After selecting the interface you will be land on Interface Source Definition a place where you can configuring the adapter. To create adapter please click on this link (How to create adapter in Agent). After creating the adapter, you can test the Query to see the data and then save it. How to monitor the result? As we know, the number of records will define how SKYVVA Integration can integrate. You can monitor the result depend of the value of record you define. Check the result in Message Monitoring Board if the records are less than Integrate Max Size. Check the result in Batch Control Board if the records are greater than Integrate Max Size. Check the result in Bulk Control Board if the records are greater than Integrate Batch Max Size. How to monitor in Message Monitoring Board?